This might be my fave Dare topic to date, because this definitely deserves a place in my scrapbooks. A few years ago, Erin and I worked at a local alternative newspaper together. She was a journalist and I was a graphic designer. We had many, many strange adventures and assignments together and it's where we became friends. We decided that we were going to start a band someday. Maybe an all-girl band. Erin decided the band name should be the 'mind bullets' and it stuck. 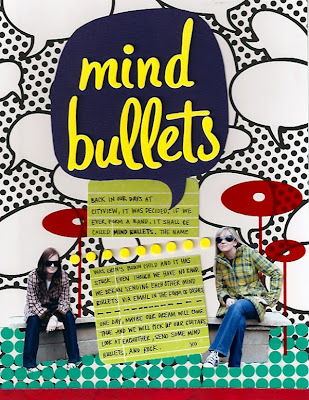 And we began sending each other mind bullets via email. It was our superior form of mind reading and sharing brain waves and things like that. And so I dedicate this page to my friend Erin. And today you must check out Kara's first post at Work Your Soul. Subject: Flocculence. It's incredible and you must see the rest for yourself. I love love this layout. How'd you do the yellow lettering? I'm waiting to see your first album btw.